Collect, Cleanse, Roll, Drink and Repeat.Sustainable living in many countries throughout the World is inherent within the culture. Since sustain-ability is really focused on the ability to sustain something over a period of time, civilizations have learned the good and the bad of human curiosity. In Jared Diamond’s book Collapse, we are able to view civilizations throughout history and their respective achilles heels. One major global issue that has persisted from the beginning of civilization has been access to drinkable water. 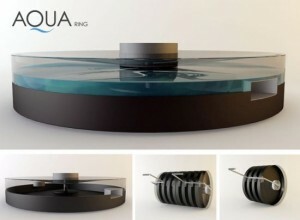 Now, a group of eco-designers have come up with an innovative solution to help: The AquaRing.